Marine le Penn and Farage are two disgusting racists too far. How dare they use Mandela- a man whose life, beliefs and convictions could not be further from theirs - to in some way tack their nasty wee bigoted dirty rag of a flag to. Farage- a nasty, greedy wee man who was goosestepping through English villages when Madiba languished in chains and voiceless in prison; Le Penn who is being prosecuted in France for comparing Muslims praying in the streets to the Nazi occupation. Watching Bush, Cameron, Blair etc slap backs and spout that "Mandela forgave all..." made me feel physically sick. Mandela can be quoted out of context and used by vampires picking over his corpse now. But those left in poverty, without homes, hope, limbs and loved ones by these vicious hawks should and do know, Mandela pointed his finger at their likes for excerbating the man made conditions that create poverty. 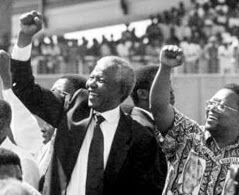 Mandela may have forgiven in order to ensure transition from racist state to a state in which legislatively everyone was equal- but he was no mug. He saw through their nastiness and although eventually meeting Thatcher, made it clear just what he thought of her and her Government's bolstering and its ministers profiting from the racist regime, when on his first visit to the UK, he refused to entertain her. He knew the people who create poverty. He was not and is not a symbol for them. That raised, clenched fist was not for these selfish, careerist, self aggrandising, bigoted murderers. It was a sign, he is a symbol of solidarity with workers who have been beaten, incarcerated, victimised, tortured, exploited, segregated, banned, fenced, impoverished, shot, blamed and lied to. And it was a sign to say that the exploited will one day win. It was a sign in defiance at the likes of these dreadful excuses of human beings that their tormenting and exploitation for their selfish gain will be defeated.